we are one of largest manufacturers of CO2 welding wires in India, with manufacturing capacity around 7000MT/year. We are ranked amongst the most trusted firms deeply engaged in offering a wide range of CO2 MIG Welding Wire. We are manufacturing and import the CO2 wire products from universal market in competitive price. We have maintaining the entire ranges of CO wire products. 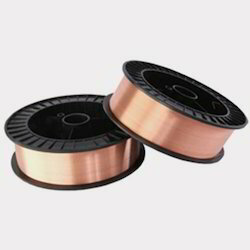 "ROMERO WIRE" is a copper coated manganese-silicon bearing wire for GMAW using Co2 or 80 % Ar - 20% Co2 mixture for shielding. "ROMERO WIRE" is designed for all postional welding of structural steels, presure vessels etc. The weldmetal is of low hydrogen type and radio graphics quality. We are capable to customize our range of CO2 Mig Welding Wire as per the client’s specification.Welding of structural steels with tensile strength upto 540 N/mm² for fabrication of bridges, steel frames, construction equipment, vehicles, ships, machinery etc. Also for joining of corten steel sheets. We are specialized in offering Co2 Mig Layer Welding Wire to our customers. Our presented product is extremely used in the market owing to their top features. We are leading manufacturer and supplier of Co2 welding wire. Please feel free to contacts us. We are offering MIG and Co2 Welding Wire to our clients.